Offices and businesses that, often, need to print a large volume of documents will find assistance in the devices featured in the HP Color LaserJet Enterprise CP5520 Printer Series review. These printers are not only easy to use but they have extremely large capacity trays, which enable them to handle the daily printing requirements of an office, without the interference of frequent reloading. In addition to this, they can print in large format. You can broaden your options in business with these printers’ capability to support a wide range of media forms and sizes. With this attribute, you can create your own materials to market your products in whatever medium you desire, from the size of a postcard to SRA3. You can, likewise, print impressive presentations and reports. For the best output, these printers are able to, automatically; adjust their settings in accordance to the size and form of media used. With the tools they are equipped with, one of which is the Instant on Technology and a powerful processor, these devices are capable of printing at a fast print speed from the very first page. This reduces the use of energy by 50%. Duplex printing, further, reduces printing and paper costs by 50%. On the other hand, HP EasyColor and HP ImageREt enable them to deliver the same high quality printouts from beginning to end. This is, likewise, supported by the use of original HP cartridges, with its wide color gamut and toner that allow sharp text, eye catching images and remarkable drawings. This prevents reprints since they give a consistent quality of output. By means of the HP ePrint, you can print, anytime, from mobile sources such as a smart phone or a laptop. Moreover, with the brand’s secure hard disk, you can protect personal and confidential data. 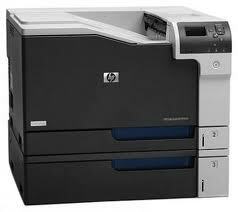 The CP5525n and the CP5525dn are laser printers that measure 21.42” W x 23.07” D x 18.31 “H and weigh 117.51 lbs. These include a 2” LCD control panel display that lets you, easily, navigate through printer menu. They have a processor of 800 MHz which allows them to print an A4 size at a fast speed of 30 pages per minute for both mono and color, with a resolution of 600 x 600 dpi. Their first page prints in a mere 10 seconds with the power save mode. They have a monthly duty cycle of 120,000 pages. While the CP5525n makes use of manual duplex printing, the CP5525dn is capable of automatic duplex printing. They make use of 3 input trays. The first tray (multipurpose) is capable of holding 100 sheets, 50 transparencies and 10 envelopes with media sizes of A3, A4, A5, B4, B5, B5, C5, DL and SRA3. The second tray has a capacity for 250 sheets and 50 transparencies with sizes of A3, A4, A5, B4, B5, B5, C5 and DL. The third tray can hold 500 sheets with the same sizes of the second tray. Their output tray is capable of holding up to a maximum of 300 sheets, 300 transparencies and 40 envelopes. These printers support different forms of media such as plain paper, light paper, tough paper, intermediate paper, recycled paper, heavy paper, extra heavy paper, heavy glossy paper, transparencies, labels, stock cards and envelopes. They have high speed USB and Ethernet connectivity. They have an 8GB high performance secure hard disk that keeps qualified information, secure. The CP5525xh is a laser printer that measures 29.33” W x 27.09” D x 34.84” H and weighs 370.38 lbs. It has a fast print speed of 30 pages per minute for mono and color. You don’t have to wait long since its first page prints as fast as 10 seconds. It has the same capacity as the CP5525n and CP5525dn for its 3 trays: 100 sheets for the multipurpose tray, 250 sheets for the second tray and 500 sheets for the third tray. In addition to this, it has 3 extra trays that can hold up to 500 sheets each. All these add up to a capacity of 2,350 sheets. It supports the same sizes and forms of media as the CP5525n and the CP5525dn. It is, also, capable of duplex printing. It has a 120GB HP High-Performance Secure Hard Disk that protects confidential data. The HP Color LaserJet Enterprise CP5525n, CP5525dn and CP5525xh are the new laser printers from HP that make use of extremely large capacity trays to meet the volume printing requirements of any office. This gives continuous workflow, without the need of regular reloading. These printers, likewise, allow you to print at your own convenience and even when you are mobile with the HP ePrint Technology. With the help of Instant-on Technology, they deliver high speed performance while reducing energy costs by about 50%. This not only boosts productivity in an office but helps in cutting down on costs of operation. These printers, likewise, produce high quality prints with the use of integrated technologies that are exclusive to HP such as the EasyColor and HP ImageREt plus the use of its original cartridges and toner which maintain their consistency in quality..
HP Advanced Auto Media Sensing enhances efficiency in the workplace by allowing an automatic adjustment of printer settings to conform to the variations in sizes and forms of media. Duplex printing, which gives the convenience of printing 2 sides of a page at one time, lets you save on paper costs by 50%. This is another plus when considering overhead expenses. With the ease of use, fast speeds, professional quality output and the extremely large paper capacity these printers have to offer, offices and businesses may consider investing in these devices for their massive printing needs. With HP’s exclusive technologies they integrate and their flexible paper handling, they would, definitely, improve efficiency and increase productivity in any place of work. Furthermore, they are cost-efficient, letting an office save more on energy and production costs. Clearly, this HP Color LaserJet Enterprise CP5520 Printer Series review has cited all the advantages of acquiring any of these versatile printers.